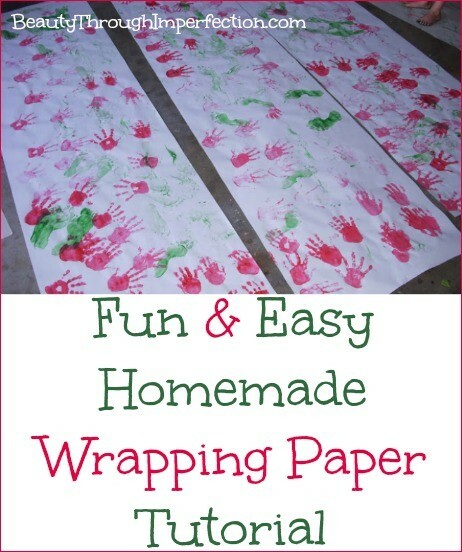 Have you ever wondered if you could make your own Christmas Wrapping paper? It is a super fun craft idea, and it makes the presents under the tree look so pretty and festive! I wish I could claim this idea as my own, but this is actually something my sister did last year. I thought it was absolutely adorable, so of course, I wanted to share it with all of you (with her permission)! Red & Green WASHABLE paint! Spread the rolls outside in the driveway or in your garage. Anywhere with lots of space where you can get all messy! Then, let the kids go wild walking on the paper with painted feet and spreading their hand prints around! Be sure you leave the paper out and flat for awhile so that it can dry completely before you start wrapping gifts! I’m posting this idea early, so hopefully if we all plan ahead we can have time to do pretty wrapping paper like this this year! I know my kids would love to give it a try, and you know all the grandparents would enjoy the extra “gift” of custom wrapping paper! Looking for more Christmas fun? Click here for tons of ideas and inspiration to help you write a Christmas newsletter that your friends and family will LOVE reading! When my kids were little we made our own paper as well. We used vegetables cut into shapes and stamped on it. I also let the kids draw on it. Great idea with the little feet and hands. Hi Paula! The wrapping paper is such a cute idea! The kids will have so much fun doing this! I’m not sure about all that paint in the garage though! Maybe we’ll have a warm day so they can do this outside! Thanks for sharing! Blessings from Bama! That looks like such a fun and great idea Paula! Brilliant idea! Pinning this now! This would be such a fun project to do with the kids. I’m sure I’d be tempted to cut some off and frame it. Thank you so much for sharing this at Frugal Crafty Home Blog Hop! Thank you! I was actually trying to figure out a cute way to wrap up the homemade presents I’m making my family this year. What a great idea! Love this! I did something similar for Mother’s Day a few years ago. Grandma’s just adore baby feet! :) Thanks for linking this up at the Make Bake Create Party! This is just the neatest idea. I love it. I’ve got to do this with the kids this year. Thanks for sharing at our Thursday Favorite Things Blog Hop. 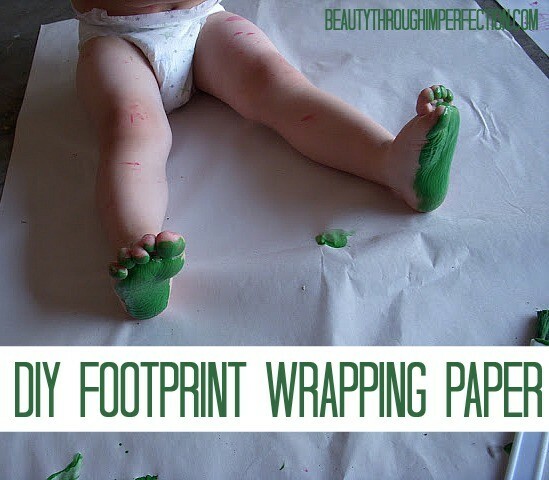 I absolutely love this idea and know that my MIL would LOVE to get presents wrapped in my son’s footprints. She’d probably save it forever. Thanks for sharing on the weekend re-Treat link party. 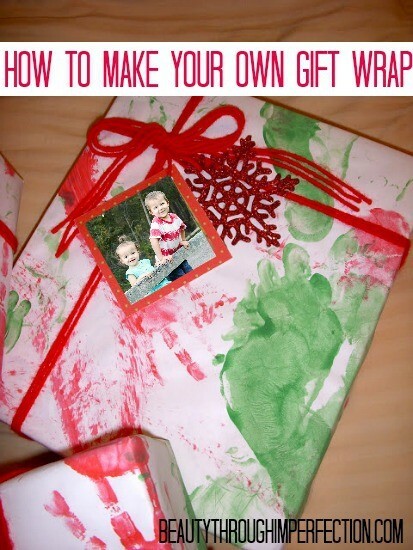 I love this gift wrapping idea! My little boy would have a blast doing this. Pinned! Paula, this is so adorable and I’m in love with the baby’s photo with the little green feet! :) Thank you so much for joining us and sharing at Best of the Weekend. Pinning! Hope you have a happy Sunday! Oh how the kiddies would love this! Both making it and unwrapping it. Thanks for sharing with SYC. 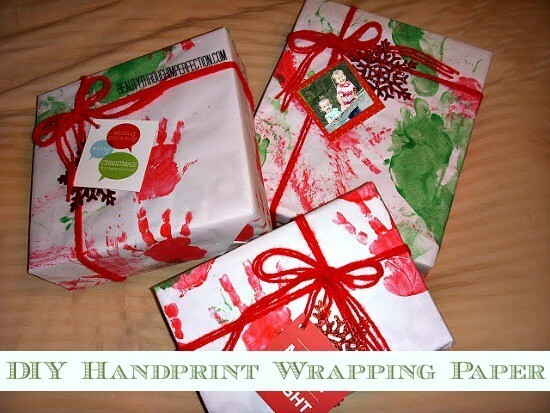 I featured this tutorial on my DIY Christmas: Gift Wrap Inspiration post today at Our Secondhand House. I hope you will come by and check it out! 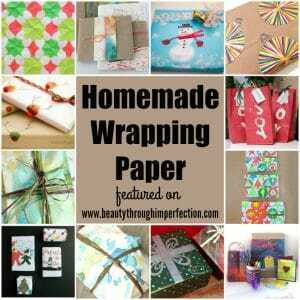 Hey Buddy!, I found this information for you: "Make Your Own Christmas Wrapping Paper!". Here is the website link: https://www.beautythroughimperfection.com/make-christmas-wrapping-paper/. Thank you.